Seychelles, sits in the middle of the Indian Ocean off the coast of East Africa consisting of 115 coral & granite islands and home to only 89,000 people. 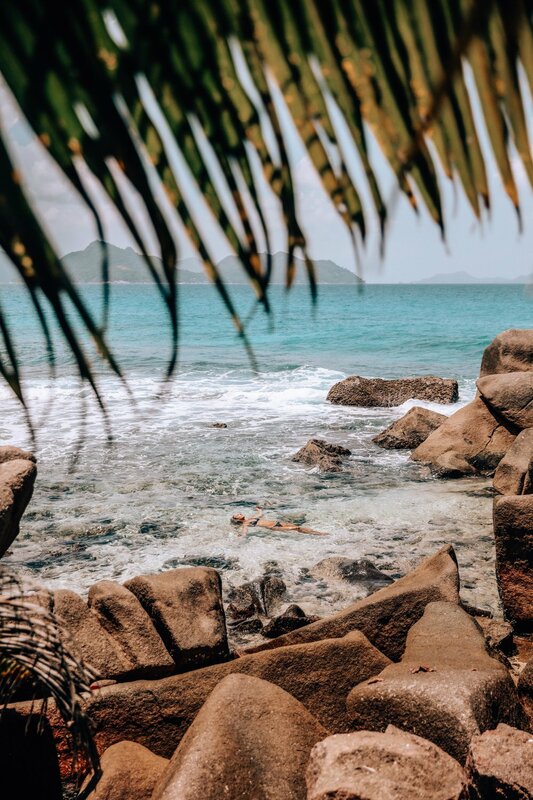 There is a reason they call Seychelles “paradise on earth”… It’s most definitely a BUCKET LIST destination, in every sense of the word! 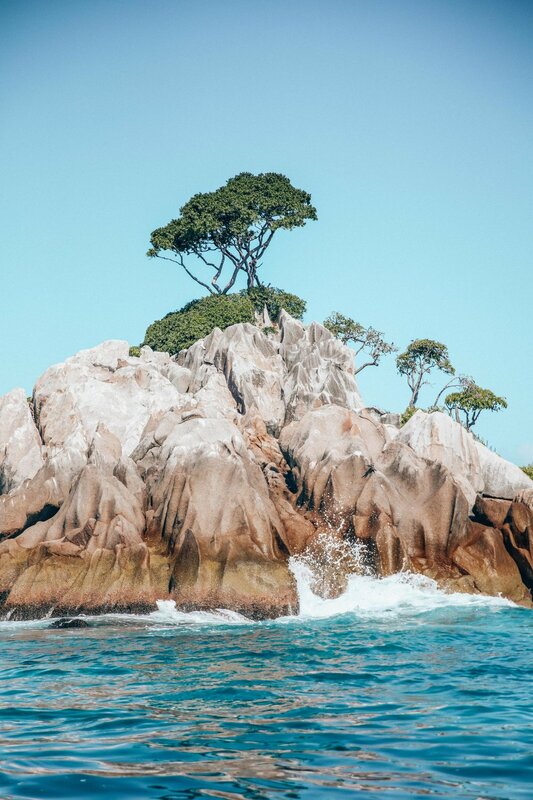 Among all the beautiful islands are marine sanctuaries, UNESCO-listed nature reserves, and home to endemic species like the giant Aldabra tortoises, black parrots and the rare Coco de Mer palm. Mahé is the largest of the 115 Seychelles islands and has a beautiful capital city, Victoria. The second largest island is Praslin and third main island is La Digue. We were fortunate enough to visit all three during our time there. The flight from Gatwick is fairly straight forward, with a 2-3 hours stopover in Dubai, nothing too strenuous and only a 4 hour time difference once there. Having landed in Mahé, we pre-booked a ferry to Praslin Island which took 1 hour - but it’s also possible to take a short 20 minute flight (the prices are higher). We were told that visiting Seychelles in February, is there wettest month. However, we didn’t see one drop of rain until our last day… VERY lucky. Once we had reached Praslin Island, we were picked up by Raffles who took us back to their beautiful resort to check in. 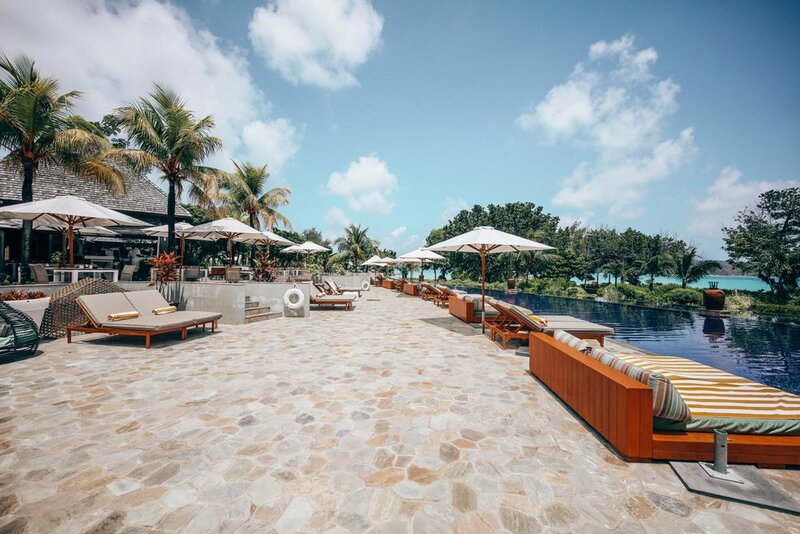 Raffles, is a laid back luxurious resort, with 86 villas situated on a lush hill side with unobstructed, panoramic views of the Indian Ocean. Each villa has a plunge pool and the bedrooms are light, well designed and spacious. Shortly after we checked in, we were swiftly taken by a chauffeur driven buggy to our villa! Once settled into our stunning room, I went off for a SPA treatment, which was the perfect treat for someone with jet-lag and in need of some rejuvenation! The luxurious SPA features 12 treatment pavilions, showcasing the spectacular view of the blue ocean, tropical gardens and dramatic granite boulders that looked like they’ve been painted in. I enjoyed the signature massage which encompasses several techniques from Thai, Balinese and Eastern influences. We relaxed into our sumptuous surroundings by spending the rest of the afternoon by the pool. The pool at Raffles is one of the most wonderful features of the hotel, It is elegant and MAGNIFICENT in size. The water was like silk with scenic views over the ocean. The Losean restaurant sat behind the pool serving snacks and drinks throughout the day. There is also a beautiful beach and activity shed, where paddle boarding, kayaking and snorkelling are available at anytime. After a restful afternoon we were taken to Anse Lazio beach where we were served champagne and canapés to enjoy during the most spectacular sunset. Our evening ended by having dinner in the Curieuse Restaurant for the catch of the day. A delicious way to end our day. We had the most divine breakfast in our villa and then were taken to the Valee de Mai Reserve, a UNESCO World Heritage sight, 15 minutes from Raffles. This sight is famous for the Coco de Mer, the worlds biggest nut! Although these nuts are for sale (they’re not cheap), it is illegal to take the nut home with the liquid inside! We didn’t buy one, if that’s what you’re thinking…. Whilst on our trail, we were also lucky enough to see the black parrot, in its natural habitat, amongst amazing trees and cute geckos. 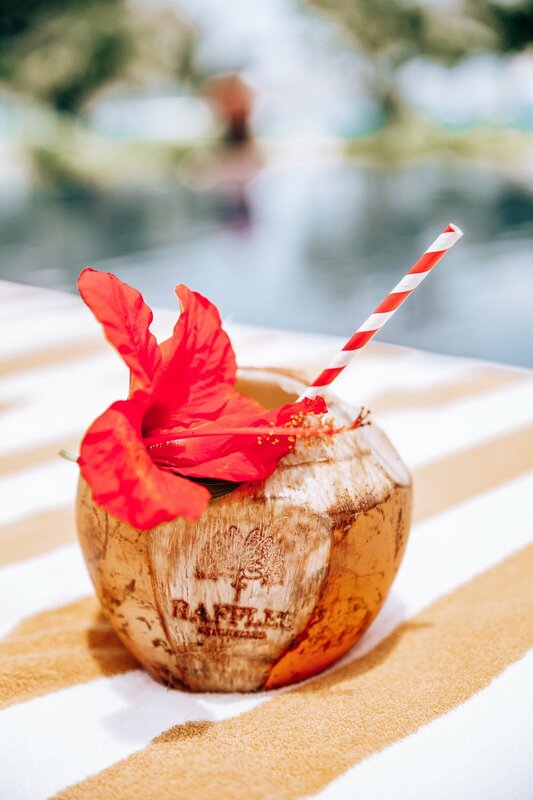 We returned to Raffles and after a restorative swim we went to the cocktail bar and made, with the hotels mixologist, the renowned Singapore Sling cocktail! The following day we went on a La Digue excursion on the Raffles private boat with Stefan, the Digital marketing manager from Raffles. You can truly appreciate the landscape of the islands by boat - the views are stunning, with huge granite boulders bursting through the lush greenery. La Digue is a charming island with the most beautiful beaches, including one particular famous one - Anse Source D’ Argent. There’s only 1800 people living on La Digue, where cars are sparse and mostly everyone gets around on bicycle. We cycled around the island for most of the day, enjoying the ocean views and the beaches, whilst working up quite a sweat! This island is gorgeous in every way imaginable. We ate fresh fish for lunch and were able to stop on our return trip to swim and snorkel in the ocean, which was warm, clear blue and silky smooth on the skin. Having worked up a healthy appetite on our excursion, we tucked into a delicious Tandoori evening by the pool. The food at Raffles was absolutely delicious and was always served by smiley and charming staff who never forgot a name. Before we left Raffles, we had a private cooking class, over looking the ocean and were also given personalised ‘hand embroidered’ aprons to take home!! I mean, this was a cooking experience we weren’t going to forget. The head chef, taught us three traditional Creole meals - which we then ate for our lunch over looking the Ocean. 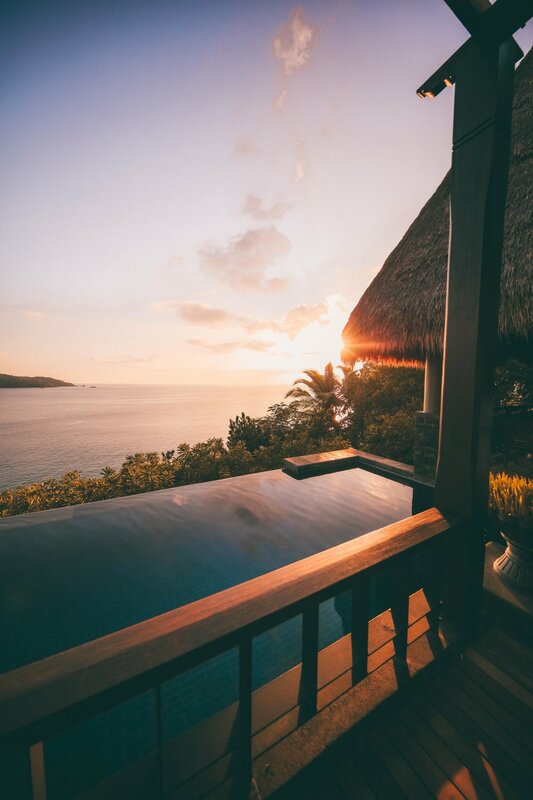 Our next destination was Paradise Sun Hotel, set amongst the most stunning and panoramic views of Seychelles . Paradise Sun is a charming hotel, with a very African vibe to it. It’s in a unique situation, with 26 French-Creole beach bungalows with wooden decks opening out into the gardens and towards the white sandy beach. In total there were 70 superior rooms and 10 deluxe, making 80 in total. We had two separate deluxe bungalows, both facing the ocean which were traditional in appearance but high in comfort and style. Once settled and unpacked, we walked around the tropical gardens of Paradise Sun and made our way to the Spa, which was tucked behind luscious greenery. On the way to the Spa we took a look at the traditional Creole house, which gives an insight to how people originally lived. We had a ‘couple’s spa treatment where the Balinese therapists, who used organic, natural ingredients. After the massage they ran me a beautiful bath, which sits in on private decking outside - it was nothing short of AMAZING. The main restaurant of Paradise Sun is on the beach, which has a wonderful bohemian vibe; with local musicians playing easy music in the background. 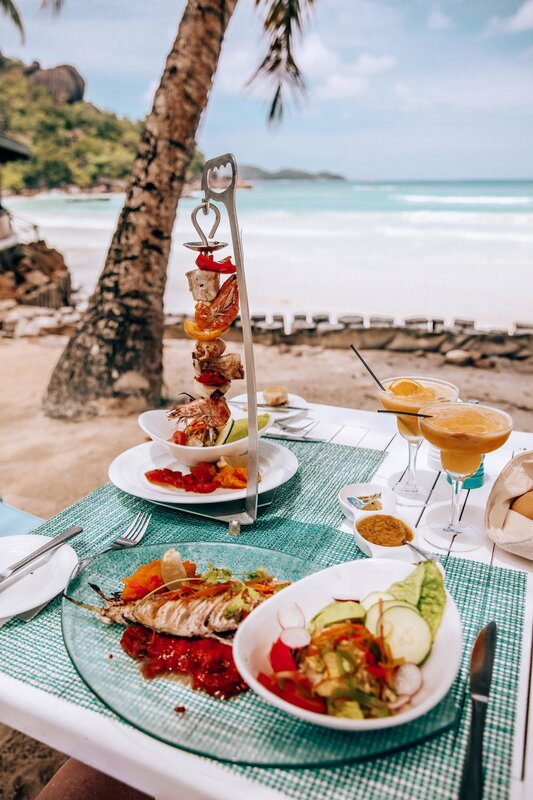 Nothing quite beats eating a meal with sand between your toes, and the dress code stipulating that shoes are not necessary. A buffet is always served, but if that doesn’t tickle your fancy, then there is an Al a Carte menu on offer. Buffet style wins for me, it’s that perfect excuse “I am on holiday, gonna eat my heart out”! Favourite selfie of all time! On our return trip on the boat we stopped and went snorkelling and swimming, seeing many beautiful local fish and coral - only wish I had my go pro with me! Paradise Sun Hotel is a popular honeymoon destination (you can see why), and on our last night they set up the honeymoon table for us - even though it was very much, a ‘mother & daughter’ table. Eating and drinking champagne, watching the sun set against the gentle blue ocean, was an evening to remember. The charm of Paradise Sun hotel was it’s relaxed, but hugely efficient feel, nestled on the white sand, with the clearest blue warm ocean at an arms distance from wherever you are. This place felt truly unique and individual to anything I’ve ever experienced before and will forever be etched in my memories. After a fond departure from the warm and friendly staff, we were taken to to the ferry terminal to venture back to Mahe island. 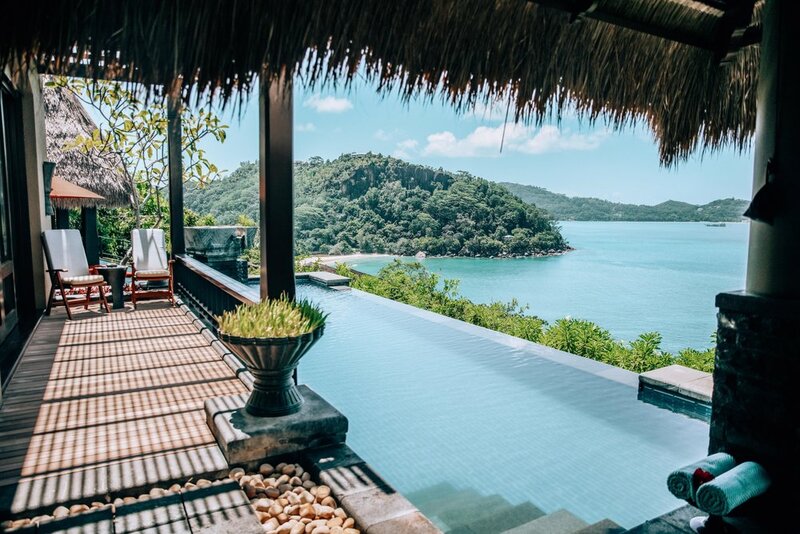 We were collected from the ferry terminal and as soon as we drove through the security gates of Maia Resort, we knew that we were entering a different exclusive environment. Maia, the name inspired from the gods. Maia being the daughter of Altas, and the mother of Hermes. Thus, beautiful Hermes products are featured throughout the property and in every bathroom. Each of the 30 thatched properties say luxury and seclusion in bucket loads, all sharing different views of Seychelles. Our villa looked over lush greenery and Anse Louis beach. Having been welcomed, we were taken to our beautiful villa and introduced to our butler, Ari. YES, you read that correctly - our own BUTLER, Ari! Ari was from Indonesia and was utterly delightful, with his warm infectious smile and friendly manner, made us love him immediately. We wondered how we could bring him home to England, although he didn’t seem very keen on the English weather (fair enough)! Maia is beyond all inclusive, which basically means you can eat and drink your heart out! Ari would organise anything we needed, he’d make and deliver breakfast, pour us Gin and Tonics (asked for our favourite gin), daily coconuts, clean our villa, and even run the bath! Ari was our magical fairy for three day, oh, and have I mentioned I LOVED HIM! Maia’s motto of Whatever, Wherever, Whenever was true to their words, as they provide undivided attention whilst offering uninterrupted privacy. On our first evening we decided to make the most of the villa and have dinner by the pool, over looking the ocean. Ari brought and served our food, which was chosen off the restaurant menu, we decided on Japanese, I mean why not - when do we EVER have fish like it, in England!? After a blissful nights sleep Ari delivered our floating breakfast.. it’s not everyday you get to have a brekkie in the pool! After our very strenuous morning… We went to the SPA, where the beautiful entrance led us into and exotic hidden forest. We were given fresh tea, a foot scrub and then the choice of which oils to be used on our skin. You would have thought, after all these massages that I would be soft and unwound - but I was the opposite! The Balinese masseur actually said I had lots of ‘knots'…. please tell me how!? Either way, he worked his magic on me for 60 minutes and I came out a new person! Beach sports are offered in this ultimate getaway of a resort, with the exemplary service, offering anything at anytime, we collapsed on a beach bed and soaked in the environment, with the water gently lapping our toes. We were staying over Valentines night and the hotel had organised a Valentines evening in the restaurant, Roses and Hermes perfume were on the table, and we savoured a delicious five course meal, but again staying true to the philosophy of the resort, we could change any part of the menu if we desired (we didn’t need to!). On our last day, we met the the mixologist, Anna, and visited the herb garden to pick some fresh herbs for our early evening cocktail. Maia is definitely one of those dream places to escape to. We thoroughly enjoyed this luxurious experience. We said a big farewell to Ari, still trying to persuade him to come with us - but he was having none of it. We were taken to airport a short 20 minute drive away and said goodbye to sunny Seychelles! I want to say a huge thank you to ALL three hotels for your wonderful hospitality! We had the most unforgettable holiday and I am forever grateful. Big love and thanks for reading!